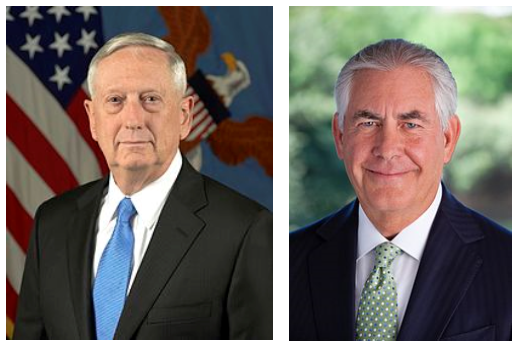 Secretary of Defense James Mattis and Secretary of State Rex Tillerson are the adults in the room of Trump. I don’t necessarily agree with the political orientation of the two men, and their agendas, but I sense that they are men of principle and character. They are the adults in the current administration and it gives me some degree of comfort to know these two men are in the positions they are in, Defense and State. They will not do anything stupid just because “the boss said so.” They will stand up to Trump when necessary. They will not be the lackeys of Trump or anyone else. They are now working for a petulant, puerile, self-obsessed and basically ignorant president. The only question I have is: How long will they last?